The world needs educational environments that inspire the brilliant thinking and creativity required for 21st-century learning. Educational facilities must attract the brightest students, faculty members and researchers with spaces that support innovation in learning and teaching. The most effective classrooms are dynamic forums for dialogue and interaction. Whether it’s a digital library or a classroom that doubles as a multimedia studio, technology is enhancing the learning experience in exciting ways. From campus master plans to the design of academic and research buildings as well as recreation and wellness facilities, HOK leads many significant education projects that will attract and retain the next generation of students. Early in the design process, we test program requirements and look to optimize a building’s configuration to reduce operating costs and maximize our client’s capital investment. We’re always looking for more efficient, cost-effective and sustainable solutions while providing the highest quality learning environments. The University of Delaware has begun construction on renovations to Delaware Stadium and the new Whitney Athletic Center. Kansas State University unveils HOK-designed master plan for athletic facilities. A new Joint Health Sciences Facility in Camden, New Jersey, will be shared by Rutgers University-Camden, Rowan University and Camden County College. USC’s new Michelson Hall brings together researchers in a startup-like environment that could be mistaken for a Silicon Valley workplace. James Braam and Shawn Sanem share how stakeholder input helps them design branded experiences for campus recreation facilities. Built in 13 months with no change orders, Clemson University’s Allen N. Reeves Football Complex won a Building Design + Construction Building Team Award. Watch drone footage of the construction of Clemson’s new Football Operations Complex, which opened in January. A new events center at California Baptist University in Riverside will open in July. 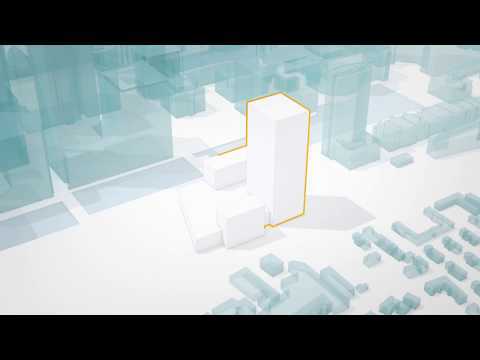 Paul Whitson discusses the value of cost estimating during design and construction. The University of Florida has selected HOK to design a new football operations project and a dining hall for all student-athletes. HOK designed the largest, most amenity-rich football operations complex in the NCAA for Clemson University. HOK is designing Kuwait University’s new College of Architecture and College of Computing Sciences and Engineering buildings. Athletic Business has named the Beauchamp Recreation & Wellness Center at the University of Portland a 2016 Facility of Merit. A Tradeline article features the University of Chicago’s William Eckhardt Research Center, where the research extends from the sub-molecular scale to the expanses of the universe. The University of Wisconsin-Stevens Point broke ground on a new 176,500-sq.-ft. Chemistry Biology Building. Cardiff University has selected HOK to design a $110 million Translational Research Facility as part of the institution’s plan for its Innovation Campus. The University of Louisiana at Lafayette’s new Athletic Performance Center has become a central hub for student-athlete development. The University of Glasgow has appointed HOK to design a new 150,000-sq.-ft. research hub in Glasgow, Scotland. 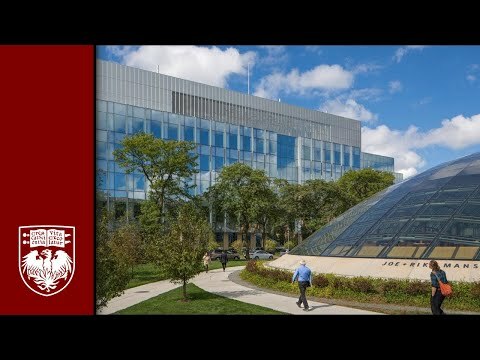 The University of Chicago’s new William Eckhardt Research Center brings together its first molecular engineering program and its Nobel Prize-winning physical sciences research groups. In this Facility Manager Magazine article, HOK’s Brad Schrock and Nate Appleman summarize the questions every team owner or athletic director should ask about their aging facilities. ASU’s Sun Devil Fitness Complex has been honored with an Athletic Business Facilities of Merit award. The University of Miami Frost Music Studios won design awards from ULI and ENR. The Board of Regents of the University System of Georgia has selected HOK to design a new Interdisciplinary Academic Building on Georgia Southern University’s campus. The new William Eckhardt Research Center at the University of Chicago hosts a broad spectrum of 21st-century science. HOK is designing the expansion of the Wellness Center at South Dakota State University in Brookings. HOK is designing a new Patient Care Center for the University of Missouri-St. Louis’ Colleges of Optometry and Nursing. HOK explores the trends influencing the design of undergraduate engineering education facilities. HOK projects won three awards at the 2015 National Intramural-Recreational Sports Association conference. The renovation and expansion of LSU’s student recreation center includes a lazy river, CrossFit training slope, 35-foot climbing wall and field expansion. 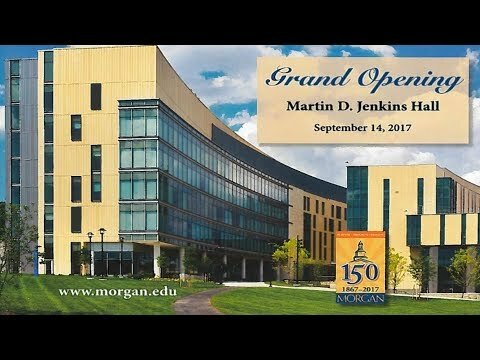 Watch the grand opening ceremony for Morgan State University’s new Jenkins Hall in Baltimore. 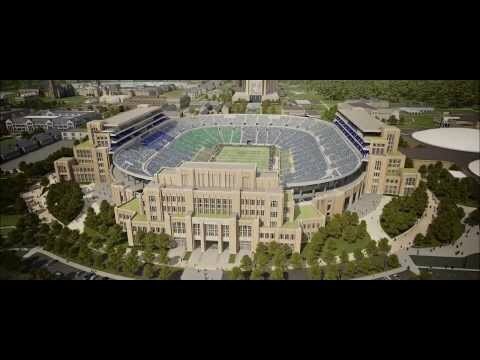 Sports Illustrated highlights the consideration of history and tradition that went into upgrades of the Notre Dame Football Stadium. Take a video tour of KAUST’s award-winning campus. James Braam highlights Auburn University’s innovative new “corkscrew” jogging track in his Athletic Business article﻿ on making tracks a focal point for the design of recreation centers. HOK’s Science + Technology group outlines a vision for STEM learning facilities of the future. The University of Maryland, Baltimore, has broken ground on the 10-story, 428,970-square-foot Health Sciences Facility (HSF) III designed by HOK. The University of Wyoming’s Energy Innovation Center brings geology to life with its 3D visualization lab. The University of Southern Indiana Business and Engineering Center earned an Honor Award in the Indiana AIA Design Awards. USA Today shares photos of the state-of-the-art locker room that HOK designed for Ohio State University. The New York Times profiles a new trend that was part of HOK’s design of a wellness center for Towson University in Maryland: gyms that incorporate obstacle courses into fitness training. Nate Appleman is a member of the Sports Business Journal’s “40 under 40” Class of 2014. 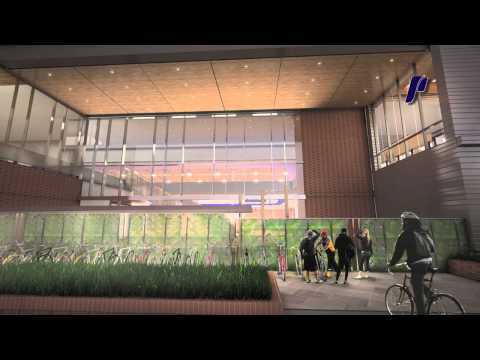 Watch a video of the groundbreaking for the University of Portland’s Beauchamp Recreation & Wellness Center. The Campus Crossroads Project will maximize the potential of Notre Dame Stadium by bringing together academics, athletics and student life. HOK’s design of King Saud University, which opened in 1984 outside Riyadh, created extraordinary spaces to be discovered within the protective, enclosing walls.